LAS VEGAS, Nevada — Resurrection Fighting Alliance (RFA) president Ed Soares announced that the RFA will be returning to Minnesota in March. The main event of RFA 36 will will feature the first title defense of RFA featherweight champion Raoni Barcelos. He will put his title on the line against undefeated prospect “Groovy” Landon Vannata. 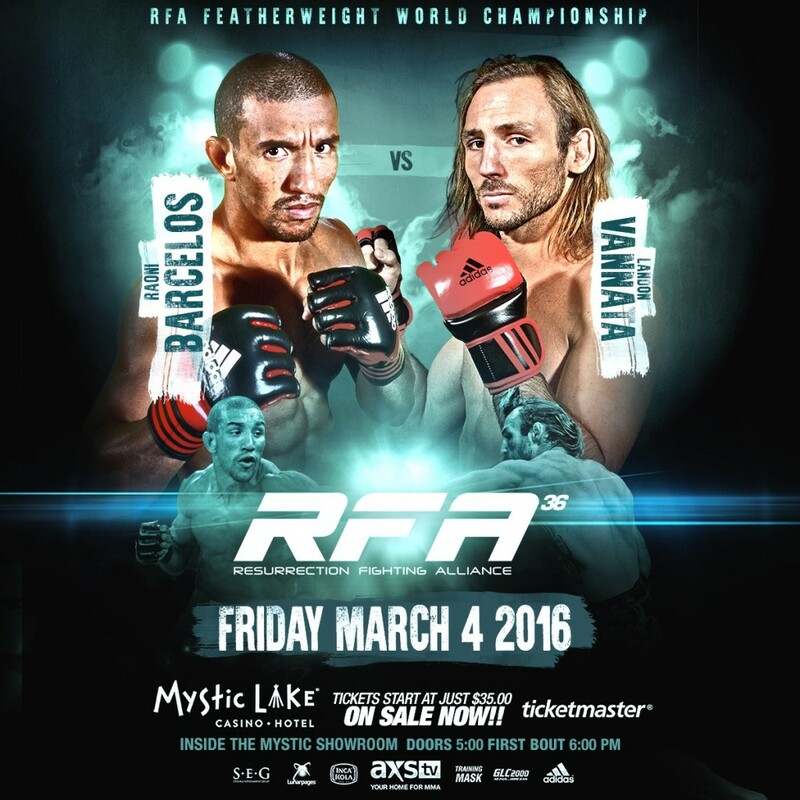 RFA 36 – Barcelos vs. Vannata will take place Friday, March 4th at the Mystic Showroom inside the Mystic Lake Casino Hotel in Prior Lake, Minnesota. The entire main card will be televised live and nationwide on AXS TV at 10 p.m. ET / 7 p.m. PT. Tickets for RFA 36 – Barcelos vs. Vannata are available for purchase now on Ticketmaster or the Mystic Box Office at 952-445-9000. You can also support your favorite fighter by purchasing your tickets through CageTix.com/RFA. Barcelos (9-1) will defend his RFA featherweight title for the first time after enjoying a dominant 2015, which made many longtime MMA pundits look prophetic. Barcelos has been pegged for greatness in MMA before he ever stepped foot inside a steel cage. The son of Jiu-Jitsu coral (red-and-black) belt Laerte Barcelos, he began learning “The Gentle Art” at age two. Then, unlike many jiu-jitsu black belts, Barcelos found success in Freestyle Wrestling where he competed as a member of the Brazilian National Wrestling Team. However, what has really made him unique among MMA prospects with his rare blend of high-level grappling disciplines is the fact that he prefers using his striking power to get the job done. This is evident in the fact that more than half of his victories have come via KO or TKO, which includes the first round KO of previously undefeated NCAA Division I All-American wrestler Jamal Parks at RFA 23. Barcelos is now looking to do the same to another undefeated prospect as he prepares for his first RFA title defense. 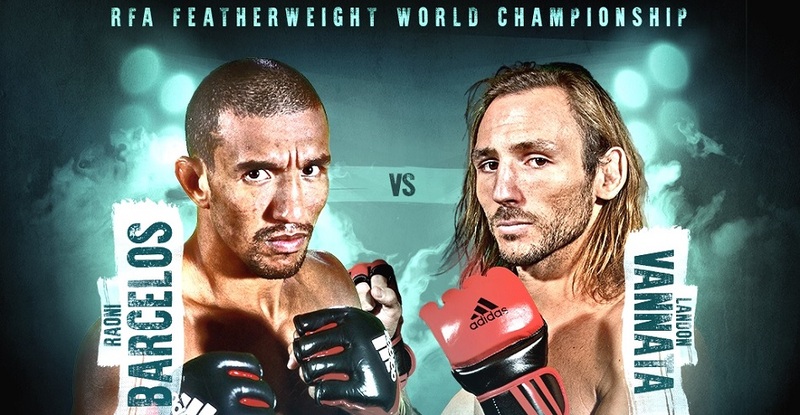 Vannata (7-0) also enters this title fight on a huge wave of momentum inside and outside the RFA Octagon. In November, “Groovy Lando” only needed 89-seconds to TKO previously undefeated Chad Curry in the co-main event of RFA 32. On the morning of the fight, Vannata’s hometown newspaper the Albuquerque Journal ran a story on him, where they described him as an artist. The feature article started by saying, ‘Some artists paint in oils, some with watercolors. Landon Vannata’s preferred artistic medium consists of punches, kicks and chokeholds.’ Vannata’s artistry was on full display later that night with a performance that earned him “Knockout of the Year” and “Prospect of the Year” nominees in the annual RFA – Fans’ Choice Awards. Vannata now looks to have RFA gold strapped around his waist and he was quite poetic when sharing his thoughts on how that will happen. “Saturday morning headlines will read: ‘Barcelos goes down! RFA’s Groovy King has been crowned! During the fight he looked scared and confused, Raoni didn’t know what to do. When Lando attacked, he never held back. He hit him like Tyson and danced like Ali. The champ had fallen before the end of three’,” proclaimed Vannata. The co-main event of RFA 36 will feature another high-octane featherweight bout between two of the Midwest’s most heavy-handed fighters. In 2015, Melvin “Career Killer” Blumer (12-3) and Shawn “The Exception” West (12-6, 1 No Contest) both registered the biggest wins of their careers, which began back in 2010. Blumer landed the “Backhand Heard Round The World” at RFA 24, which knocked out UFC vet and MMA pioneer Jeff Curran in the first round of their co-headliner in March 2015. Meanwhile, West also picked up the biggest win of his career by stopping RFA and Bellator vet Andre Tieva via first round TKO in December. Tieva is a friend and training partner of Blumer, which will add another interesting twist heading into this showdown. Blumer and West, who have been successful at both bantamweight and featherweight, will meet at 145-pounds for their RFA 36 co-headliner. The feature fight of RFA 36 will see the RFA debut of one of MMA’s top flyweights in Chico “The King” Camus (14-7, 1 No Contest). The eight-time UFC vet will enter this bout after going the distance with past and future UFC title challengers in his last two bouts. Camus holds a notable win over longtime UFC star Brad Pickett, as well as the only UFC win over four-time UFC vet Kyung Ho Kang. He will face three-time RFA vet Matt Brown (10-5), who will be dropping down to 125-pounds for the first time in his career. The hard-charging Brown shares more than a name with the popular UFC welterweight. Their fighting styles are equally crowd-pleasing, which has made the smaller Brown an RFA fan favorite during his highly-entertaining wins over bantamweight standouts Andre Tieva and John Castaneda. The full RFA 36 fight card and further information regarding this event will be announced soon. RFA 36 will be the promotion’s fourth event to take place in the “Land of 10,000 Lakes” (Minnesota) and it will be the third RFA event of 2016. The entire main card of RFA 36 will be televised live and nationwide on AXS TV at 10 p.m. ET / 7 p.m. PT on Friday, February 19th.